As parents, we play different roles. At some point we are either any or a combination of being a superhero, a soldier, a doctor, a nurse, a driver, a bank teller, a teacher, a preacher, a clown, and a friend. Our children expect us to be as flexible as Mr. Fantastic and our children keep a keen eye on us day in day out. What we do is what they would become. It is imperative that we pay attention to our actions. The sooner we realize that we have greater responsibilities the moment a child becomes part of our lives, the better. Parenting is complicated, I know, and it is normally easy on theory but a whole lot different when everything happens right in front of your face. Kid cries, kid wants food, kid poops, kid pees, kid makes a mess. And kid gets sick. And some kid, later on, would have special needs. There is no turning back. Hard truth. It takes someone strong, wherever that strength may come from, to say “I can do this.” A good parent commits, a good parent loves…without condition. Child first, everything else takes a backseat. It took some time to get my acts straight when it comes to alcohol. Several times I was behind the wheel under influence with Marcus inside the car, I had days I missed getting him to bed because I can barely hold my own, and there was one day I missed him blowing his birthday cake because I’ve passed out. Been that bad father. Honestly, I somehow miss drinking with friends. Those days when cheeks would get warm and tight. Those days when eyes drop halfway, then the world starts turning. Those days when inhibitions are lost and words come out freely and without care. All for the heck of doing it. In vino veritas. But perspectives and priorities changed. I am alcohol-free, almost. I’ve made myself 24/7 for Marcus as much as possible. I’m his fireman who would jump the pole and would be there for him in no time. I would only drink if Marcus is not around or if I know Marcus’ needs are all taken care of. I think I could now qualify as best parent yet not. Others have far challenging stories. So to all of you out there who continue to make sacrifices and continue to love their kids with special needs, hats off to you. Happy Sunday. I finally got myself a pull-up bar which wifey paid for as an early birthday gift. No more waiting for good weather just so I can go out of the house to do my pull-ups using our window’s coping. Now Marcus can do his own set. The bar is tough. It can be fitted between door jambs and manual says it could hold 100 kilos without screws. I’m several notches past 60 now and it can hold me without any problem. Anway, I still installed the screws that come with the kit to add 30 more kilos to the weight margin. For 1500 pesos this pull-up bar from Decathlon Festival Mall is so worth it. Thanks again wifey and Marcus for this great gift. It’s a great day despite the overcast skies. Just had a 500-calorie breakfast after my usual second run of the week which is the routine I’ve tried to stick to for months already. You see I have never been committed to running, not to mention waking up early, in my entire life. Now I hit 5 km on average and this week I broke my personal time by clocking below 35 minutes and with a best pace of 5.5. I hit plateau in August and since then I decided to take actions. It was a personal challenge I took seriously just to test if everything I read about losing weight while staying fit is one that I can also achieve. So I jumped into the fitness bandwagon–extra weight in tow. Measurement is key. Everything almost done by the numbers. In fact, I’ve caught myself doing things just so I would know the calories I take. I’ve called waiters to ask how many grams my serving has. I used the kitchen weighing scale more often than before–and was worried when the ones seven segment display broke. I would take time reading nutritional labels at the grocery isle. And I would log on my MyFitnessPal app, if not scan the barcode of any food packaging, any food I consume every meal. It’s a strict routine but fortunately not in vain. On this tenth month of 2017 I now hover close to the magic number. I just stepped on the bathroom scale and it shows I’m 0.6 away from being exactly 10 pounds lighter than when I first started my calorie watch regimen and trend shows that it’s a matter of days when I breach 140. It doesn’t end here though. According to basal metabolic calculator–my age, weight, height all factored in–my ideal weight is 4 pounds farther. That means more restrictions ahead but I know I would hit it soon anyway. MyFitnessPal predicts five weeks which is just a couple before my birthday. I think that by then I would have earned the right to celebrate it with my favorite 200-calorie Krispy Kreme. 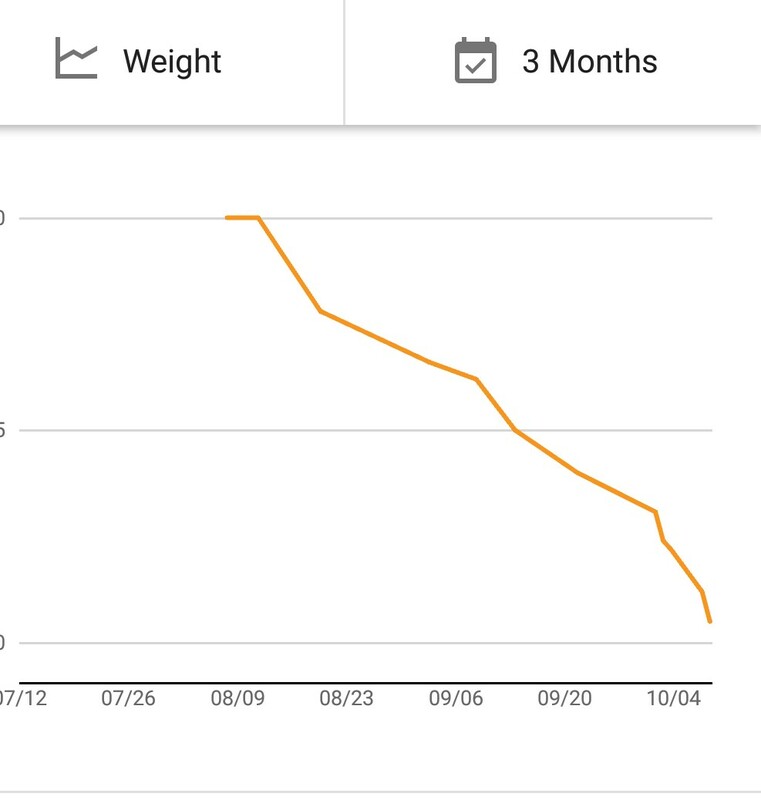 I finally breached the 150 mark by a pound down. No small feat after struggling for more than six months since our December vacation that piled all the fats and the additional nine pounds. No regrets about those fudge and all the giant food servings but I just can’t carry them around all day anymore. While seeing the magic number on the weighing scale calls for a personal celebration given the sacrifices and conscious efforts to limit food like my favorite pizza, it seems I reached the dreaded plateau again. My weight reduction progress have flatlined. Desperate times call for desperate measures then. Time to do something long overdue, time to count calories like I’ve never done before. Resisting the initial idea of my wife to use an app that would monitor my calorie intake I eventually ended downloading it from Google Play and I got hooked on it since then. MyFitnessPal seems like the perfect app I need. It made me realize I’ve been missing a lot on the opportunities to see the numbers behind each food I take. Grams versus calories, fats versus protein, carbs versus fiber. It was overwhelming at first but I picked up on how to process the data in less than one day. Under Armour is the company that created this free app. 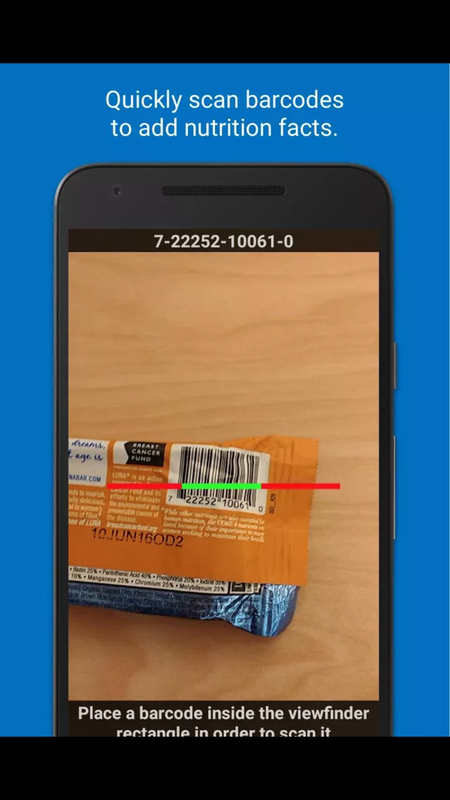 Users can search and log from its database almost any food taken during any meal including snacks. Unlike the health books I once knew, this app includes almost anything. You ate isaw, monggo, or galunggong? MyFitnessPal recognizes these local foods and its corresponding nutrional values. Had buko pie or piyaya for dessert? Yup, this smart app knows them too. The key here is just to be honest and log everything to see if you are still within your calorie goal. And the good news is that this app considers exercises performed on the same day so you can exert extra effort if you just lost control and had extra rice for lunch because it was perfect with the leftover longganisa. Besides manual entry of exercises, this app likewise connects to several smart devices. I got a Garmin watch and its Connect app works with Under Armour’s MyFitnessPal app. Data is pretty straightforward. Calorie goal minus food intake plus exercises equals remaining calories for the day. It does the math so all you need to focus is if you are still allowed to pick that tempting smores in the fridge or not. Your call but be ready to face the consequences if you go over the required servings. While this fitness app presents useful info, discipline falls on the hands of its user. Setting the right expectations is needed to avoid any frustration and blame game. Take one step at a time and see realistic results happen. Remember that whatever is measurable is controllable. 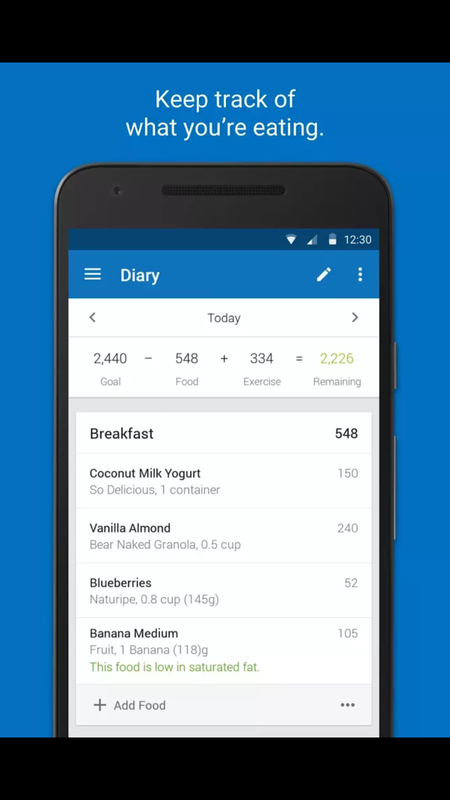 MyFitnessPal also works for weight maintenance or weight gain goals. My Timehops show that I usually go on a diet same time for the past years. Must be the subconscious working to prepare for December’s binge.